We’d love your help. 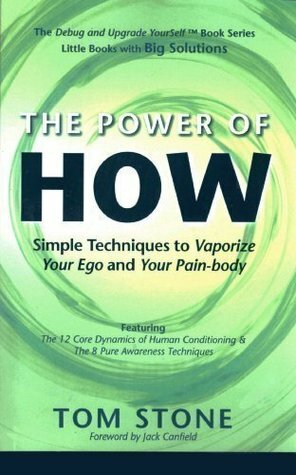 Let us know what’s wrong with this preview of The Power of How - Simple Techniques to Vaporize Your Ego and Your Pain-body by Tom Stone. To ask other readers questions about The Power of How - Simple Techniques to Vaporize Your Ego and Your Pain-body, please sign up. TOM STONE has pursued a multi-faceted career as a novelist, travel writer, historian, and stage- and screenplay writer. Simultaneously, he has had a very successful career in the professional theater as a director, lighting designer, and stage manager. While at Yale, where he gained a BA in English Literature and an addiction to the theater, he spent his summers toiling backstage at the prestigious Green Mansions Summer Theater near Lake George, New York. Contacts he made there garnered him a job as an Off-Broadway stage manager, and the following year he became an assistant stage manager for Jerome Robbins’ Ballets: U.S.A.
After a decade of working as a stage manager and assistant director for Robbins and Harold Prince on the original productions of “She Loves Me,” “Funny Girl,” “Fiddler On The Roof,” and “Cabaret” as well as the now-legendary efforts of Robbins’ American Theatre Laboratory (for which he wrote the play “Work in Progress,” he took a sabbatical from Broadway with the intention of spending a single summer in the Greek islands writing a first novel. As the Greek Fates would have it, he stayed twenty-two years. In the process, he married the French painter he met on Patmos, became a father of two, as well as a teacher of English and Theater at Anatolia College in Northern Greece, and a lighting designer and director for the Greek National Theater. In 1992, with his children in U.S. universities and his marriage moribund, he returned to Broadway via London and Vienna while working as resident director with Harold Prince’s new, Broadway-bound musical, “The Kiss of the Spider Woman.” But breaking completely back into the theater after so many years proved impossible. So, when one of his short stories was optioned for a TV movie, Tom headed west and soon found work writing film scripts for hire. As of this writing, ten of them are the market but none have as yet been produced. Meanwhile, he devoted the greater part of his writing time to writing books. His memoir of living on Patmos, “The Summer of My Greek Tavérna,” was published by Simon & Schuster in 2002 and was selected by the Book-of-the-Month Club and Quality Paperback Club in 2003. It has been translated into eleven languages, including Dutch, German, Danish, Hebrew, and Mandarin (Taiwan). After having been under option by Fox Searchlight Pictures in 2012, it is now in development with Grove Entertainment.